Abydos (Arabic: أبيدوس, Greek Αβυδος), is one of the most ancient cities of Upper Egypt, dating back to the late prehistoric era. About 11 km (6 miles) west of the Nile River and 300 miles south of Cairo, the ancient site is a mosaic of styles and customs, representing the political, social, and religious evolution of the long-lasting and unique Egyptian Empire. Although the site was looted for centuries before archaeologists like William Matthew Flinders Petrie and Auguste Mariette could establish standards of research, Abydos has provided significant information regarding the history of Egypt. In particular, the "Table of Abydos" lists all the pharaohs, a unique validation of knowledge of this time period. Sites such as Abydos, illuminating the nature of this outstanding civilization, provide valuable insights into human history and consequently support the advance of human society. The city was originally called Abdju (technically, 3bdw, hieroglyphs shown to the left), which meant "the hill of the symbol or reliquary." The name Abydos comes from the Greeks, who named the city after the port city of the same name located on the Hellespont. The modern Arabic name is el-'Araba el Madfuna (Arabic: العربة المدفنة al-ʿarabah al-madfunah). 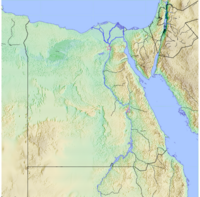 The history of the city of Abydos begins in the late prehistoric age, before Egypt was a unified civilization. The oldest tombs and structures are located in the lower northern part of the site. They mostly consist of rulers and persons of high social status in the pre-dynastic era, the oldest seeming to date back 150 years before the first dynasty. A majority of these tombs have been plundered and sustained damage from natural disasters. However, at least one tomb, U-j, still contains artwork and funeral accessories providing evidence that the Egyptians made technological and artistic achievements centuries before the unified civilization, which created the more recognizable pyramids. When the dynasties of Egyptian civilization were established, Abydos was still being used primarily as a cemetery. The Royal Tombs of the earliest dynasties were placed about a mile back on the great desert plain, in a place now known as Umm el-Qa'ab. The earliest is about 10 feet by 20 feet inside; a pit lined with brick walls, and originally roofed with timber and matting. Other tombs are 15 feet by 25 feet. The tomb probably of Menes, the first pharaoh of unified Egypt, is of the latter size. After this, the tombs increase in size and complexity. The tomb-pit is surrounded by chambers to hold the offerings, the actual sepulcher being a great wooden chamber in the midst of the brick-lined pit. Rows of small tomb-pits for the servants of the king surround the royal chamber, many dozens of such burials being usual. It was at this time, around the first dynasty, that private citizens began to be buried at the site in pit-tombs. By the end of the second dynasty the type changed to a long passage bordered with chambers on either hand, the royal burial being in the middle of the length. The greatest of these tombs with its dependencies covered a space of over 3,000 square yards (2,500 m²). The contents of the tombs have been nearly destroyed by successive plunderers. However, enough remained to show that fine jewelry was placed on the mummies, a profusion of vases of hard and valuable stones from the royal table service stood about the body, the store-rooms were filled with great jars of wine, perfumed ointment, and other supplies, and tablets of ivory and of ebony were engraved with a record of the yearly annals of the reigns. The sealings of the various officials, of which over 200 varieties have been found, give an insight into the public arrangements. A major change in function and perspective happened when the tomb of Djer was mistaken for that of Osiris, the jackal-head god of the netherworld, and the site took on the role of a sacred site. Abydos became the cult center for worship of Osiris. Egyptians made pilgrimages to the site at Abydos where they believed Osiris to be buried. They also desired to be buried there, but if that was not possible, they set up stelae with their name and title inscribed together with their prayer to Osiris. Thousands of such stelae have been found at the site. The twelfth dynasty was the beginning of a long period of massive improvements to the site, starting with the gigantic tomb that was cut in the rock by Senusret III. During the nineteenth dynasty Seti I founded a great new temple to the south of the town. This is the building known as the Great Temple of Abydos, being nearly complete and an impressive sight. Its principal purpose was the adoration of the early kings, whose cemetery, to which it forms a great funerary chapel, lies to its rear. The Great Temple contains a tunnel displaying the "Table of Abydos," a chronological list of the pharaohs. The temple was originally 550 feet long, but the forecourts are scarcely recognizable, and the part in good state is about 250 feet long and 350 feet wide, including the wing at the side. Both Rameses II and Merneptah added to the tomb. Rameses II completed the construction and built a smaller temple of his own, simpler in design and scope, but containing many significant historical accounts on its walls. Merneptah added what is known as the Hypogeum of Osiris, connected to Seti I's temple by large chambers. In the Hypogeum, the Osiris mystery rituals were practiced. This time period is well known for the amount of building and rebuilding that took place. The eighteenth dynasty began with a large chapel of Senusret III, and then Thutmose III built a far larger temple, about 130 feet by 200 feet. He made also a processional way past the side of the temple to the cemetery beyond, with a great gateway of granite. 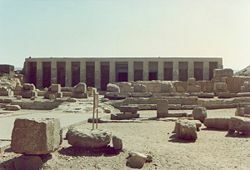 Rameses III added a large building; and Ahmose II in the twenty-sixth dynasty rebuilt the temple again, and placed in it a large monolith shrine of red granite, finely wrought. The foundations of the successive temples were comprised within about an 18-foot depth of ruins; these needed the closest examination to discriminate the various buildings, and were recorded by over 4,000 measurements and 1,000 levelings. The last buildings to be erected in Abydos were constructed under the reign of Nectanebo I during the thirtieth dynasty. After that the city seemingly lost its importance as a pilgrimage and funeral site as the Egyptian Empire declined. Some Romans used the site for burial during their occupation of Egypt, but there was little if any maintenance done on the site and for centuries it fell into ruin and decay. Like so many famous Egyptian sites, Abydos was pillaged for many centuries before archaeologists and Egyptologists could secure the site for study. During the French occupation of the Nile under Napoleon's rule, a list of the rulers of Egypt that was engraved on the walls of the tomb of Rameses II was removed and eventually sold to the British Museum, one of many tales of important pieces being scattered across the world. The British occupation of the region brought in such pioneering Egyptologists as Auguste Mariette and William Matthew Flinders Petrie who were among the first to excavate the areas with scientific rigor. Petrie in particular unearthed pieces that raised the possibility that Abydos may have been a much older site than originally thought. During the nineteenth century, Henri Edouard Naville gained fame for his excavations of pit chambers. However, Abydos was long overshadowed by more easily recognizable sites of Giza and Thebes, until William John Bankes discovered the "Table of Abydos," which brought more attention back to the site. Most of the tombs and living quarters have been painstakingly excavated, although few are completely intact, and certain areas have been completely destroyed by natural and other causes. An evacuation in the late twentieth century, by a joint Pennsylvania-Yale team, unearthed new sites in the southern sections of the city as well as previously undiscovered fragments of structures already unearthed, leading to the possibility that still more waits to be found in Abydos. The site is maintained by the Egyptian Supreme Council of Antiquities, a branch of the Ministry of Culture and is open to the public. 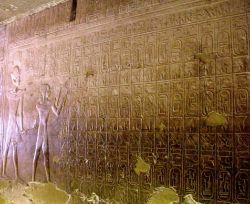 The long list of the kings of the principal dynasties carved on a wall is known as the "Table of Abydos." The table contains three rows of thirty-eight cartouches on each row. These cartouches include the names of every dynastic pharaoh of Egypt from the first, Narmer/Menes, until the pharaohs of the last dynasty. So rare is a full list of pharaoh names that the Table of Abydos has been called the "Rosetta Stone" of Egyptian archaeology, analogous to the Rosetta Stone for Egyptian writing. The table has become a definitive source of information in the field of Egyptology, helping to create a viable chronology of the civilization of ancient Egypt. ↑ Marie Parsons, "Abydos in Egypt," Tour Egypt. Retrieved April 12, 2018. ↑ W.K. Simpson, Inscribed Material from the Pennsylvania-Yale Excavations at Abydos (Publications of the Pennsylvania-Yale Expedition to Egypt) (Yale Egyptological Seminar, 1995, ISBN 978-0912532394). ↑ Misty Cryer, William John Bankes Travellers in Egypt. Retrieved April 12, 2018. Janku, Lumir G. "The Abydos Mystery." 1996. Retrieved April 9, 2007. Petrie, William Flinders. The Royal Tombs at Abydos; An Account of Recent Discoveries. 1901. This page was last modified on 20 April 2018, at 15:04.